It feels like there’s something reawakening inside of me – something that had been asleep for a long time. I find myself looking at the world around me in the same way I did as a child – like everything I see is new to me, and the world is full of new things to explore and discover. I like it. Several years ago I made a new friend through the internet – how I met her and how we became friends is a whole book in itself – and maybe someday I’ll write it. But what I want to talk about today is how that new friendship affected the way I see things. My friend, Kathi, lives on the other side of the continent in Nova Scotia. For reasons I don’t need to explain here, early in our friendship I realized that Kathi would probably never be able to visit me in my part of the world, and I had an overwhelming desire to share the beauty of what I see here with her somehow. And because Kathi is an artist, I felt a special desire to present her with images an artist would be able to appreciate. Ever since childhood I’d enjoyed taking photos, but, in my late twenties, I married a gifted professional photographer, and, humbled by his talent, I began limiting my own photography to mostly snapshots of family and friends – capturing birthday parties and anniversaries and family outings for the family photo album. Now, because of my friendship with Kathi, I started taking a different kind of photo. I wanted to show off the scenes – the flora and fauna, the mountains and beaches – of the Pacific Northwest to her. And I wanted to try to present her with photos of images in the way she might see them herself if she were here – as an artist would see them, and as a tourist from Nova Scotia would see them. This opened up a whole new world for me, and I think this is when my “reawakening” began. I began noticing line, patterns, textures, small details, colors – all the magic in the world around me – in a way I hadn’t for years. Yesterday was an amazing day. I stepped outside my house for an afternoon “photo walk” and entered an awe-inspiring world. Trumpeter swans flew in the sky to the south of me, and a pair of bald eagles swooped around in the sky to the north of me, and I was just blown away by the magnificence of it. Totally oblivious to everything but those eagles and those trumpeters, I stood in the middle of the street, mouth open in wonder, focused on capturing what I was seeing in my camera. He chuckled. I think he thought I was a little daft. And perhaps I am. But I’m sure enjoying it. I’m pretty sure the photo of the laughing Mongolian girl was taken as the little girl and her camel-friend watched me try to get on the back of another camel. Where to sit? In front of the hump or on top of it?…Nah, just kidding…I have never ridden on a camel in my entire life. This little girl expresses pure joy, doesn’t she? She has it, right now. Note that there isn’t a Porsche or BMW in the background, that the horizon isn’t filled with five-star restaurants, supermarkets, department stores, or mansions. 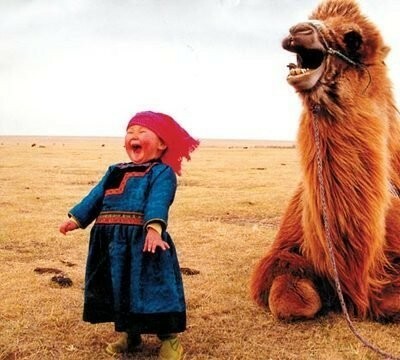 We see a little girl and a camel – both of ’em laughing – and that simple scene has the power to make us smile. If you go to the URL above, you’ll see pictures of grains of sand magnified to 250 times their actual size. And I’m pretty sure these pictures will bring a smile of delight to your face, as they did to mine. I am a rock aficionado. I can’t pinpoint when, exactly, I became a rockaholic – maybe I was born this way (my dad is, after all, a geologist); or maybe it began when my fourth grade teacher loaded us all up on a bus and took us on a field trip to a place where we could dig up agates the size of duck eggs; or maybe it was my beloved Aunt Junie who lived on the Oregon coast and trained me how to spot agates on the beach from 15 feet away – but from as far back as I can remember, rocks have held a special attraction for me. When I became a teacher, it became a Christmas tradition for me to call my students up one by one and let them choose a rock from a bowl of rocks I’d found on the Oregon coast. They’d stand in front of their classmates, holding their chosen rock, while I told them all the things I loved about them. Then I’d let them know that the rocks they were holding were “magic rocks” – and that every time they looked at their rocks the rocks would remind them of how much I loved them. Today, when I run into former students, often the first thing they’ll tell me is that they still have their “magic rocks.” That always puts a grin on my face. Rocks as big as skyscrapers that provide me with perfect handholds and footholds on rock-climbing adventures; flat, smooth-surfaced rocks perfect for skipping; boulders with great textures and patterns; and agates for my “magic rock” bowl – I appreciate the beauty of them all. But before I saw the magnified pictures of the sand grains, I’d never really appreciated the beauty of these tiniest of rocks. My feet have probably tread over billions – maybe zillions! – of sand grains in my life – over-looking them as I looked for agates or skipping stones – never really seeing the smaller treasures that were right in front of my eyes. It boggles the mind. And it makes me wonder what other treasures I’ve missed that were right in front of my eyes. Have I mentioned that I really love Snow Days? “Change does not roll in on the wheels of inevitability, but comes through continuous struggle. And so we must straighten our backs and work for our freedom. A man can’t ride you unless your back is bent.” –Martin Luther King, Jr. I love Martin Luther King’s rousing thoughts about liberty and freedom. His words stir us to lift ourselves from a place of fear, limitation, and hate, emboldening us to go to a place of confidence, love, and freedom. There’s no reason for us not to have success and freedom in life. As expressions, manifestations, and reflections of Life, Truth, and Love, we are never for a moment separated from Good. We bring it with us, wherever we go. Joy, hope, confidence – fearless living – are ours to claim. Right now. This moment. Here. So buck up, my friends! Take your stand right now against everything that would enslave you, bind you, and take away your freedom and liberty!